Application and development of interactive tutorials and exercises for redox (reduction-oxidation) chemistry are discussed in this article. These tutorials and exercises are delivered as Macromedia Shockwave files on the Web. The tutorials and the practice problems were developed and used by the instructor as a classroom presentation and by students as outside class review. Redox (reduction-oxidation) chemistry is an important topic of general chemistry. The main aspects of redox chemistry are assigning oxidation numbers, identifying oxidizing and reducing agents and redox reactions, and balancing redox equations. There are well-established sets of rules for assigning oxidation numbers and identifying redox agents and reactions. As for balancing a redox equation, specific stepwise procedures are listed in every general chemistry textbook. Redox chemistry is, however, generally one of the most difficult subjects for students, who often have trouble applying the given rules to specific problems. To master the subject, students need to work through a number of practice problems themselves. The more they practice, the better they understand what they are doing. But a key to their success is that they be given consistent feedback on their work. Our experience has shown that immediate and well-thought out feedback can be of significant benefit in helping students master redox chemistry. Our discussions concerning students' difficulty in learning redox chemistry had led us to conclude that we needed to give them more practice problems with instant and well-directed feedback. We had looked at most, if not all, of the chemistry Internet resources, commercial software packages and learning aids available. None of the Web resources or the software packages reviewed appeared to satisfy our needs or match what we had in mind. Most learning aids only grade the final equations, without giving enough feedback to the students for incorrect answers. However, we had found that when the students do not get the equation balanced, there are many possible ways that they could have arrived at the wrong answer. We wanted to be able to let the students track the sources of their mistakes. Every sub-topic includes both a tutorial and a practice problem set. The tutorial uses examples to demonstrate the application of the rules. The problems give the students plenty of practice with instantaneous feedback on their answers, so the students know whether their approach to the problems is correct. Most of the online tutorials and existing commercial software were designed for the students' after-class review. However, when we started creating the interactive tutorials, our ideas were to make the interactive tutorials useful as both classroom presentation for the instructor and after-class review for the students. The goal of making the tutorial for classroom presentation was not simply to create fancy multimedia presentations or, like most PowerPoint slides, to save the instructor the time of writing lecture notes on the chalkboard. Most instructors recognize the problem of students frantically copying notes from the chalkboard and thus not listening to the instructor in class. The main idea of creating such interactive tutorials is to free the students from mindless notetaking and let them follow closely and listen to the instructor in the classroom. The tutorials were developed based on the lecture notes written by Dr. Angela King. Notes were modified to show how material would be presented in class. These stepwise notes, coupled with comments on design, were used as the basis for the tutorials. Figure 1. A section of the storyboarding based on the lecture notes of the balancing redox reaction tutorial. The online tutorials ask the students to enter answers in a number of steps. Although it is possible to continue without answering the questions, the stepwise approach allows the instructor to enter the answers and move the formulae around on screen, possibly stopping to elaborate more on the reasoning behind the answer. The students are also encouraged to enter the answers and have the answers checked during the tutorial. The students do not need to worry about copying all the lecture material on the screen because they can always review the whole tutorial after class. Since the tutorial is interactive, the students can step through the same process as in the lecture anytime after class. AVI movie (355KB) shows an example of how these online tutorials work. A demo lets you try out part of the balancing equation tutorial. Three questions are randomly drawn at one time from a pool of problems. The student answers the questions by entering the oxidation number for each element in the formula. If the student does not get a question correct, a brief explanation for the wrong answer is given and the question appears again. To encourage the student to get the questions correct, a surprise bonus appears when the student gets all three questions correct in the same set. Figure 2. Screen capture of the oxidation number assignment practice problems. An external link to the authors' full-blown version of oxidation number assignment practice problems. A surprise bonus appears when the student gets all three questions correct in a row. Again, an equation is randomly drawn from a pool of problems. The student identifies the oxidizing and reducing agents and redox reactions by checking the boxes below each formula. A text field bar is provided above the equation for the students to keep track of the changes of the oxidation numbers of the reactants and products. Figure 3. Screen capture of practice problems for identification of redox reaction. An external link to the authors' full-blown version of Identifying Redox Agents and Reactions. This section took the most time and planning in the project. 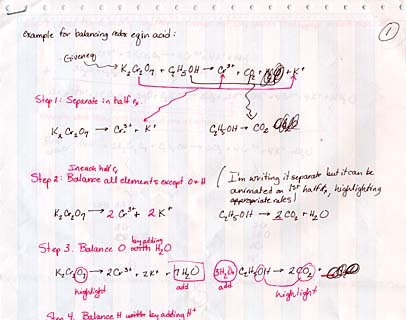 Balancing redox equations using the method of half reactions is a 6 to 7-step procedure. A number of different mistakes at different stages in the solution can lead students to an inaccurate answer. Since we wanted to provide some way that the students could track down the causes of mistakes, we had to first identify the common mistakes. Simple mathematical mistake: Mis-counting the number of atoms and/or charges on both sides is a common mistake. Multiplying the coefficients: No matter how much the instructor emphasizes the multiplication of ALL the coefficients of both sides of the equation, it is always a common mistake for students to multiply only some of coefficients by an integer. Cancellation of the formula: When the two half reactions are added together, the formulae may not be cancelled out correctly. The students do not have to follow the steps closely in order to come to a correctly balanced equation. Each step of the procedure balances one element at a time. Therefore, the half reactions are not necessarily balanced in any step except for the final steps. If we keep track closely of how the students are doing in each step, then we need to list out each step in the program. However, one of the purposes of the practice is to test if the students remember the order of the steps in balancing the redox equations. Since the students' common mistakes of balancing the redox equations are mostly mathematical, we decided that the program should provide two answer checkings: the final equation and the half reactions right before they are added together. The students have a choice to check if the half reactions are balanced. They do not have to check the half reactions in order to check the final equations. By checking the half reactions at mid-point in the process, students will know if they have miscalculated atom and charge counts of both sides of the half reactions, which is the cause of one of the common mistakes. If the half reactions are not balanced, the program will list out the agents that are not balanced. Figure 4. Partial screen capture of online exercises of balancing redox reactions to show the mid-point checking of the half reactions. The students can easily identify the sources of the mistakes. They then know where they should go back and check the steps. Two points are deducted for each unbalanced species in the half reactions. Without this mid-point check, it is impossible for the students to tell which steps are incorrect if their final equation is not balanced. Although the instructor does not keep the scores of the online practices, getting higher scores is still an incentive. Therefore, in the grading of the final equation, the program details item by item the gaining and losing of points, so that the students have an idea of how they would do in a real quiz. An external link to the authors' full-blown version of Balancing Redox Equations. An Online Jotpad is provided alongside the online tutorials for the students to take their own notes while they are going through the tutorials. The students can also save their own online notes onto their computer hard drive. When they start the tutorial again, their notes will be retrieved on the Online Jotpad. Since the notes are saved onto their computer hard drive, they can always review their notes offline, too. Figure 5. Screen capture of the online notepad, which allows students to take notes and save it onto their local hard drive. An external link to the authors' full-blown version of Redox Tutorial with the Online Jotpad. The traditional way to delivery tutorial material is by application programs, but they tend to be large and hard to deliver. Most do not fit on a floppy; they need a CD-ROM, and they are costly to update. We have been moving to using the Web for delivery of programs. Materials are authored using Macromedia Director 5.0.1, chosen because the material created can be played back using an Internet browser equipped with the Shockwave plug-in. Shockwave is available as a plugin for Netscape Navigator or ActiveX control for Microsoft Internet Explorer. The same Shockwave file can be played on either a Windows or a Macintosh platform. The Shockwave file size is small compared to other Web tools. In addition to the advantages of interactivity and multimedia capability, Macromedia Shockwave has the added advantages of fast download, small files, streaming capability, and ease of update. No special installation is required for our students to access the tutorial. The students in the class have IBM ThinkPad laptop computers issued as part of the Wake Forest University's Plan for the Class of 2000. As part of our standard software load package, each student ThinkPad has Netscape Navigator installed as the standard browser. Macromedia Shockwave plugin is also installed. The tutorial files are put on our University Web server for the students to access. The whole redox tutorial and practice problems were taught in two 1-hour class periods. In order to investigate the effectiveness of the online tutorial, Dr. King taught two sections of redox chemistry (thanks to the cooperation of Dr. Christa Colyer); one used the online tutorial and the other used the chalkboard. The students of the online tutorial section brought their ThinkPad to the classroom. They were told that they could take notes if they wanted to but should not worry about copying the materials from the screen because they could always review the same tutorial later after class. We found that the online tutorial required less time than using the chalkboard in lecture. Both sections were given the same time to practice the problems in class. The online tutorial section practiced using their ThinkPads, while the chalkboard section received paper copies of the same problems. At the end of each class period of both sections, the students were given the same short quiz. The online tutorial section scored much higher on average. The chalkboard section was also given the URL of the online tutorial afterwards. We have had positive feedback about our online tutorials from students of the chalkboard section. A survey of the students of the online tutorial section also indicated that they liked the tutorials and practice problems. Some students also asked for more development of this type of tutorial on other chemistry topics.